***Book received for consideration. Post contains affiliate links. All thoughts are 100% my own. Now, I'll admit, I might not be the best at it myself, but I enjoy it nonetheless. I suppose for me that started at a fairly young age. My mom was a crafter long before the days of Pinterest and Etsy. I remember watching her and her best friends create these fun projects together time and time again. And they even let us join the fun! For those not yet familiar, FaithGirlz offers books very similar to those from American Girl that many of us- myself included- enjoyed as tweens. Books on hair, hobbies and so much more. Faithgirlz are however- as the name implies- more for Christian girls, with topics that offer not just great tips for girls but biblical truths as well, in a way that keeps it fun for girls. This book teaches them all about crafting and DIY projects. They range in variety from decor to jewelry and fashion... even a section on Bible journaling, which I personally was very excited to see as I feel it's a great form of creative worship for ALL ages. These aren't all ' Christian' crafts, but rather offer a wide variety of projects to choose from. They are simple to follow, and so much fun to create! To be honest, while this book may be intended for younger girls, there were many projects that I too found myself wanting to recreate- the ribbon chandelier, the pom pom garland, the book page embroidery- to name just a few! 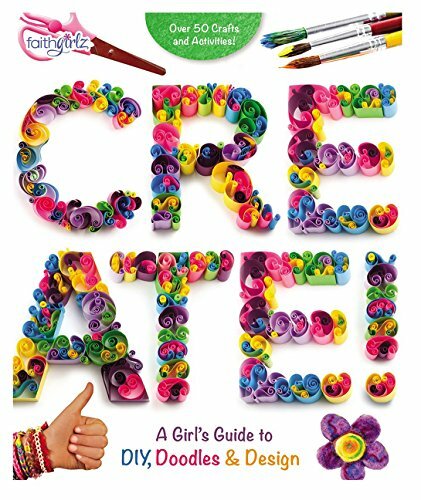 If you have a girl who loves crafting or if you're just looking for some fun summer projects for the tween in your life this summer, this book is certainly worth checking out! It is available to purchase at your favorite Christian book retailers.